Se siente como un hogar, 2 pisos, condominio privado, cocina completa, terraza con vista. Oasis privado espera detrás de hermosas paredes altas y blancas. Hacienda Del Mar, Bungalow II, Banderas ofrece un respiro tranquilizador y un punto de partida conveniente para sus futuras aventuras. Dos pisos, entrada privada. Planta baja, dormitorio principal en suite. Arriba, sala de estar / futón, cocina totalmente equipada / área de comedor / 1/2 baño y un amplio balcón para disfrutar de la brisa y la vista del río y la vida silvestre. Basura: Hay un contenedor de basura en la cocina. Una vez que esté lleno, puede llevarlo a los contenedores grandes que se encuentran en la parte posterior de los bungalows. Ofrecemos una nevera con una botella grande de agua potable como cortesía. Chofer disponible a un costo adicional Personal de limpieza a costo extra. Masaje a costo extra Reglas adicionales: - Absolutamente NO FUMAR EN TODA LA PROPIEDAD Si tiene una fiesta, primero debe ser pre-aprobado. Para un grupo grande de personas o eventos / fiestas, por favor envíenos su solicitud. Esta es una gran propiedad que puede ser perfecto para su próximo evento! Por favor envíenos un correo electrónico con sus datos - Hacienda del Mar Bungalow II, también se puede alquilar junto con Bungalow I y / o la residencia principal. - Por favor solicite precios especiales y disponibilidad para todo el complejo. Hacienda Del Mar is a great idyllic retreat from the dusty streets of La Penita. The Mexican decor of our bungalow was excellent & larger than we expected. The location is also excellent.....10 minute walk to the beach at Guayabitos & 15 minute walk to Centro in La Penita where the shopping is. Also situated in the “residential” neighbourhood we felt quite safe. 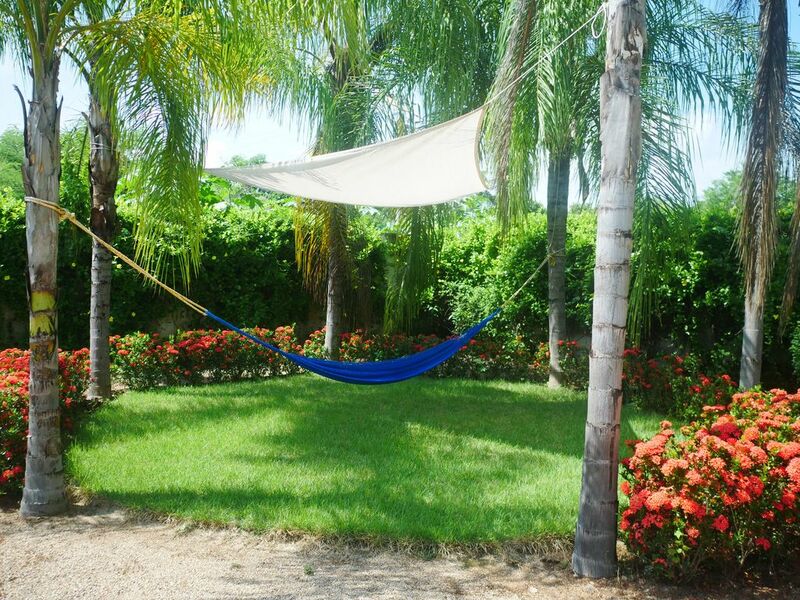 The Hacienda is adjacent to the arroyo which is teeming with birds & the resident crocodiles. Occasionally there is a whiff of the “arroyo aroma” but it wasn’t a deterrent to for us. It is also quite near the highway so the truck noise is somewhat distracting. The place is managed by Carmina who is a tireless worker & her smile every day made our day. Unfortunately, we wanted to book for the next several years, but were beaten out by other guests. Fortunately we secured a place down the road for next year that will allow us to book in the the future. You will not find a better beach anywhere! A wonderful property in a beautiful setting. The rental apartments are well furnished and roomy. We enjoyed the high ceilings in the apartment and the large balcony with the view of the beautiful garden with nice pool. We were able to watch the many birds in the trees on the opposite site of the river. Unfortunately we were bothered by an occassional sewer smell, apparently from some sewer bypass valves behind the location on the adjacent municipal property. This was a quiet place for me to spend a week collecting my thoughts while enjoying a change of scenery in Mexico.